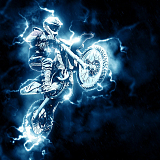 Crazy Moto Stunts - Juega gratis en PacoGames.com! Do you like motorbikes? So let´s join a new adventure. In Crazy Moto Stunts you have a choice of four bikes. There is also a police one with beacons or a terrain bike. With this one, no terrain will make you problems. Newly opened area for lovers of adrenaline. Enjoy the jumps and ramps and show your racing skills to everyone. Stunt map is large and your options are endless. Be careful not to fall from the bike. Physics are realistic enough! Enjoy beautiful 3D graphics, enjoy realistic simulation and have fun.